It’s hard to imagine anyone thinking I have “the perfect life.” (I giggled just typing that phrase!) But just in case I’ve given anyone that impression, I want to set the record straight. Right here. Right now. This is a blog about why I smile. I share with you the happy parts, hoping they’ll make you happy, too. But trust me: Things aren’t always all “sunshine and rainbows” around here! I let the laundry pile up. 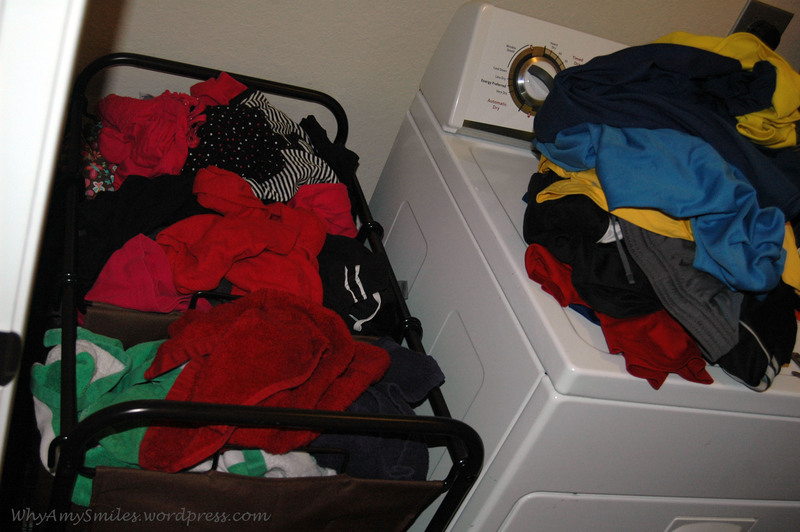 Less than HALF of what is waiting in my laundry room at this very moment….. I let the house get way too messy. I have, on more than one occasion, found things growing in our fridge that I could not identify. I have been afraid to look under my child’s bed. I have lost things that weren’t even mine. I get discouraged. I get overwhelmed. I get frustrated. Many days I am surrounded by dirty dishes and sticky floors and overdue library books and at least one cranky kid. But I am fully convinced that, even on those days, there is always something to smile about. ALWAYS. And that’s why I continue to post to this blog. My God has shown me great mercy, which I do not deserve, and He has done many great things for me. I want to share some of them here. He’s done much for you, too, and I want to remind you of that. I want to daily look around me for blessings to acknowledge, for reasons to give thanks, and for excuses to smile. And I want to motivate you to do the same. I am just like you, living with struggles, with sadness, and with sin. But together we can be on the lookout for the joy in everyday life…..the small victories…..the smiles and successes we might not notice if we aren’t actively looking. Thank you, Amy! What a joy and blessing you are to me today and to all who know you! You are real. You are honest. And you honor Him! How great the Father’s love! Oh, Amy, YOU are a blessing to ME! Thank you for your encouraging words and your life for Him! Dee, you DO seem to have it all together…but I know you would never claim to because of your humble heart. Thank you for your encouragement and your example. I appreciate you so much! Great post, Amy! I can relate to most of the “challenges” you just confessed … except the bad hair days. I got a “buzz cut” years ago so that I wouldn’t have to worry about that. (Be jealous!) Next time you find unidentifiable stuff growing in the fridge, you should totally take a picture and post it so that others can compare. :o) Tell Troy I said hi. Trust me, you DON’T want to see those pictures. (I gagged a little just remembering…) I’ll tell Troy. Very helpful thoughts, Amy! One of my best friends and I were just being “real” with each other a few days ago and it made us both feel so much better. We said we would pray for one another and remember to cherish the times we have with our kiddos. Blog life can seem so perfect, but we all know that it isn’t that way always! Thanks for sharing the good news! Thanks, Leah. Yes, seeing someone else’s imperfections is strangely comforting…I guess it lets us know we aren’t the only ones who struggle. Yes, very real — but your attitude (and faith and determination) is what I love so much about you! Makes your happy posts seem even brighter, like a light showing up in the darkness or a diamond on black velvet!! Thanks, Mom. You know where I learned that…. It is the idea of dwelling on the positive; sharing the gospel, God’s blessings, and those things that make us smile, which lessen the day to day grind, ease our burdens, and help us see the good. Thanks for sharing what makes you smile with us. It makes me smile, too! Very nice Amy, to give us such perspective. 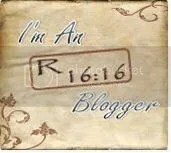 I thank you for reminding me to “keep it real” in my own blogging world. Even when a wife and mother is ill and can only guard her home while reclining on the couch, her presence is needed. Just being there creates an atmosphere of stability and purpose in the home, and it is very important for the family. Lydia, I agree. And her outlook affects everyone else in the home. Thanks for reading and commenting!